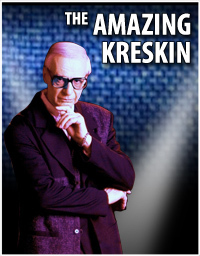 With a showman's flair, a comedian's wit and the capacities of a bona fide Mentalist or thought reader, The Amazing Kreskin for over six decades has dramatized the unique facets of the human mind: his own. His very name has become an integral part of pop culture throughout the world in comedy clubs, comic strips, print stories and TV shows. Born in Montclair, New Jersey it was during his childhood game "hot and cold" that Kreskin's remarkable ability to find hidden objects emerged. By his late teens, this icon of thought transference developed a mental test that has become the highlight of his performances all over the world. This signature piece has Kreskin requesting his cheque be hidden somewhere within the venue where he is appearing and if he fails to find the cheque he forfeits his performance fee. Through the decades audiences of all ages have been drawn to this legendary figure.